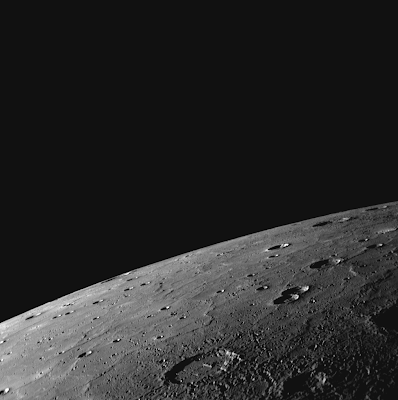 This collection of images was taken by NASA's MESSENGER Mercury spacecraft on it's 3rd flyby of the planet Mercury. 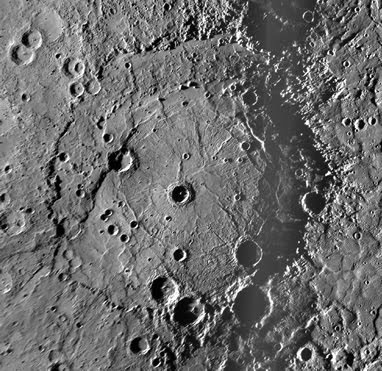 The probe is scheduled to enter permanent orbit around Mercury on March 18, 2011. These are just the first images to become available, so check again soon to see more! 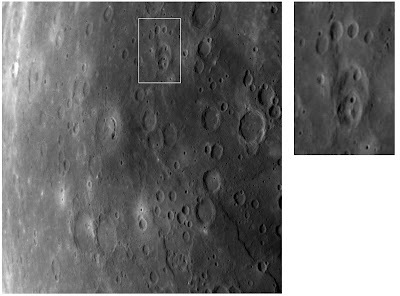 The impact basin shown above has never been imaged before MESSENGER's 3rd flyby. It is, as of this writing, unnamed. The double rings in this crater are what make it so interesting. 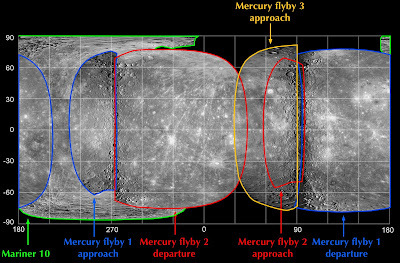 The above image from MESSENGER's WAC, or Wide Angle Camera, shows areas of Mercury that have never been imaged before. 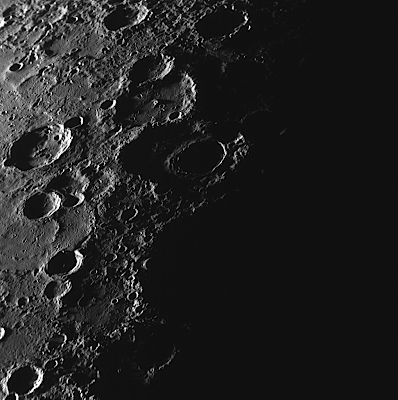 This image is a high-resolution mosaic, composed of 62 individual shots with MESSENGER's NAC, or Narrow Angle Camera. It shows smooth plains extending to the horizon. Scientists will be examining this image in further detail in the near future. 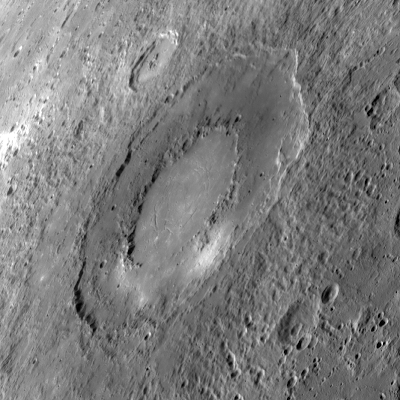 This unnamed crater appears to have exposed an ancient lava tube. 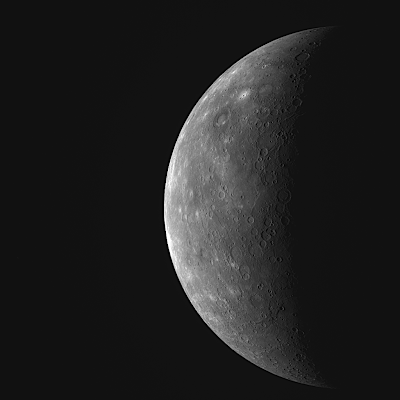 This is the third time this mysterious bright spot has been imaged on Mercury, but this is by far the best quality image yet! Another double ring impact basin. 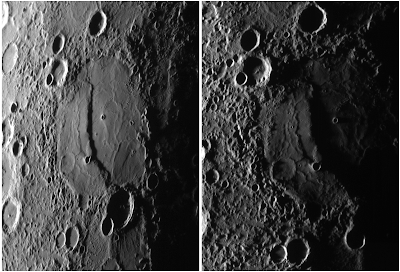 This image shows the same crater twice, one from MESSENGER's second flyby, and once from the probe's third flyby. 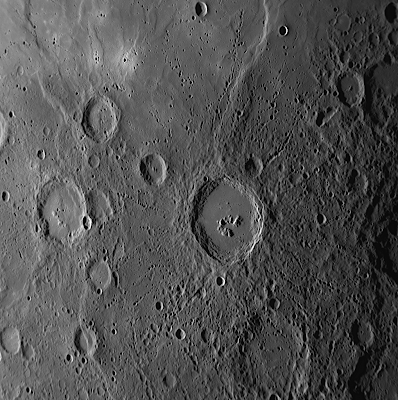 The crater above exhibits a fine example of ejecta and crater chains! These are created by the debris, called ejecta, that is strewn from the crater on impact. This crater looks like a paw print! The map above shows the total imaging coverage of the Mariner mission, and MESSENGER's 3 flybys. 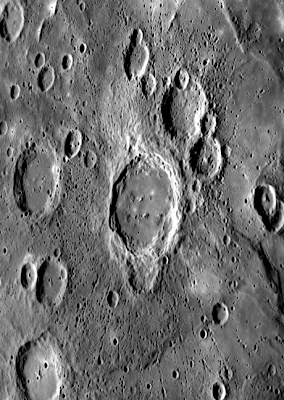 The relatively lower amount of craters on this smooth plain shows that it must be quite younger than the rest of the planet, indicating past geological activity. Above, you can see the "terminator", or the region where day turns to night. 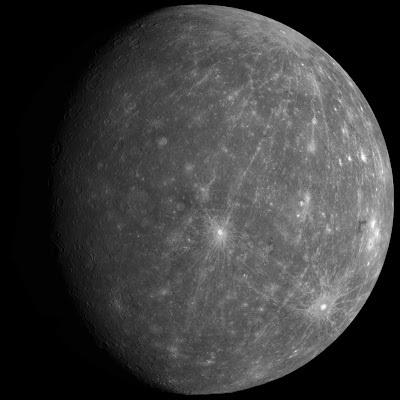 Interestingly, on Mercury, the day lasts longer than the year. One year on Mercury is just a little shy of 88 Earth-days, while a day on Mercury is equivalent to just short of 116 Earth-days! Break out your 3D glasses for this one! 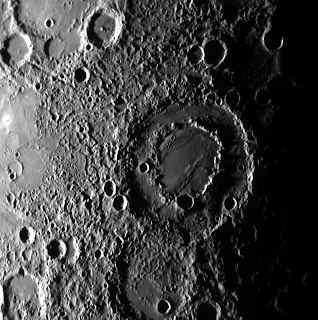 This is a composite image of the crater 'Rembrandt' and was composed from two images taken on MESSENGER's 2nd and 3rd flybys. 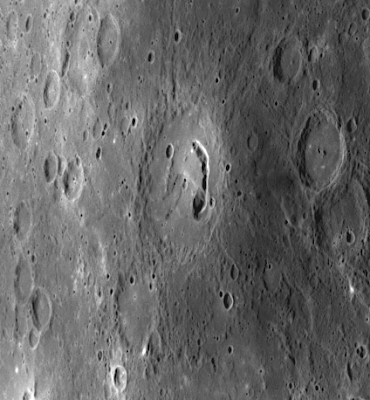 MESSENGER has discovered many craters like the one above, that have pits in their floors. 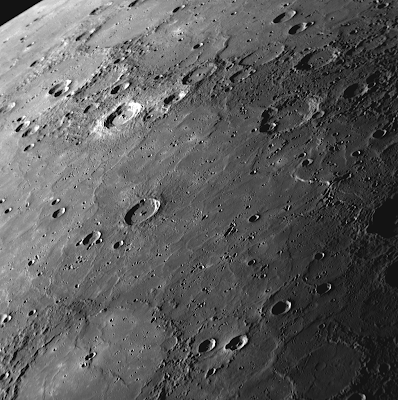 This is theorized to be evidence of past volcanism on Mercury. Magma forms underground chambers and tubes as it flows. Then, when impacted, some of these ancient tubes collapse to form these pits. 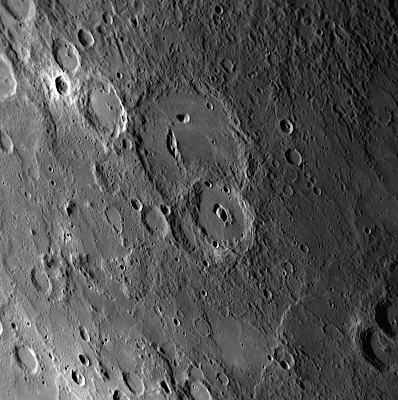 This image captures several of Mercury's geological features in one frame. 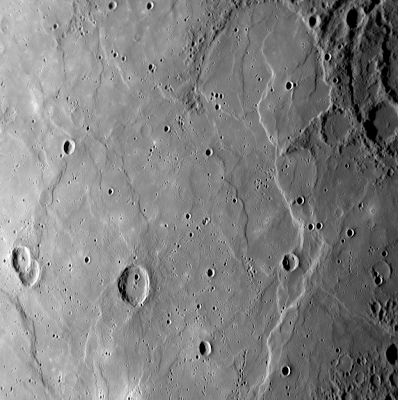 This image shows more of those smooth plains formed by volcanic activity in Mercury's distant past. 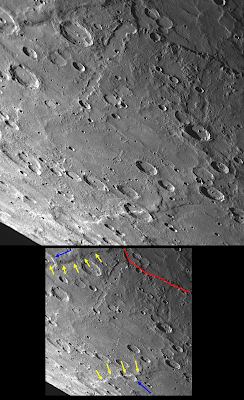 This image shows the rim of the crater Rembrandt (highlighted in red) and two surrounding scarps, in yellow and blue. More pictures will be available in the near future, so check back often! 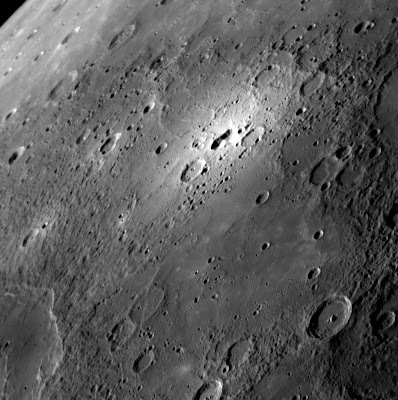 Until then, check out pictures from MESSENGER's other flybys. All images courtesy of NASA/Johns Hopkins University Applied Physics Laboratory/Carnegie Institution of Washington, except where noted otherwise. I truly value investing a while to speak about which, in my opinion securely concerning this particular and thus enjoy knowing much more regarding this sort of topic. Right now click Cash Advance Continue the great term.